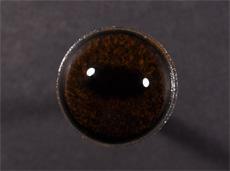 The A-Spheric line from Tohickon was the first aspheric eye manufactured for deer. Previously all eyes used in taxidermy were hemi-spherical in shape and therefore very bulbous. The A-spheric allows the eyelids to set more correctly. This line also incorporates a ridge at the base of the eye so that you can make final adjustments using a brad or styling tool. The original Tohickon work-horse, this eye will meet your needs regardless of your skill level.